Join us for a week long adventure in magical Morocco as we explore as a community of sisterhood from the desert to the sea. We will travel to the remote southern region of Morocco to experience an authentic seaside fishing village. Stunning remote coastlines dot this region, backed by the Anti Atlas Mountains, with vast stretches of sandy beaches. You will find empty surf line-ups of all types of breaks: point, beach, lefts, rights and for all surf capabilities from newcomer to advanced. As we experience this journey together, we will work on opening our hearts and minds to new adventures, cultures, friends and our inner possibilities. We will deepen our connection to ourselves and the world around us as we take to practicing yoga twice a day at our tranquil villa. Our day begins with a more active yoga asana led by our wonderful teacher, Carly of Papaya Wellness. As we listen deeply and tune in to our inner hearts we will see greater clarity and focus. Liv and Liz will lead us through dream making workshops to help us channel our dreams and desires into a path of reality. After the day’s adventures, be it surfing, exploring artisan market souks for handcrafted goods or visiting a Moroccan-style bath house or Hammam, we will be ready to relax into our second yoga nidra practice as the moon rises and lights the way. With nearly endless stretches of empty beaches along the southern coastline, we will be able to learn and progress our surfing without the crowds unlike other surf towns in Morocco. The water is pristine, and we will have our pick of perfect peaks to express our surf creativity. With ISI certified instructor, Hassan, and his team, we will be taken care of with a coach to student ratio of 3:1. Safety and attentive care is our priority, but above all we want you to have fun! Our learning environment is welcoming and supportive. A visit to a traditional market, or souk, is a must, and we will travel to a nearby small town known for their handcrafted silverwares and jewelry. Morocco is also famous for its pure Argan oil, and the Berber region is full of Argan trees. We will visit a woman’s cooperative to see how the ladies process Argan oil. Lastly, no visit to Morocco should be complete without a trip to the local Hammam, or Moroccan style bath house spa. Your surf muscles will thank you as you relax in this head-to-toe scrub and massage treatment. We will also have some surprises for you throughout the week to some jaw dropping scenery and walks. Please note hammam treatment fees and service are additional. Experience the rich and vibrant city of Marrakesh, famous for its markets, as an add-on trip before we depart. We will tour the best of Marrakesh together and enjoy a stay in a traditional riad. This 3-night trip departs Agadir on our last day of the retreat (and before the retreat for May 4-11 please see below) and embarks on a journey deep into the Saharan desert. We will travel to Marrakesh on Day 1. The next day we will head to the gateway town near the desert and aboard a camel and ride into the golden dunes for sunset. Our final night will see us returned to Marrakesh on May 20 for a final night. Guests should book their air ticket to arrive in Agadir and depart via Marrakesh. The camel trek for week 1 starts on May 1 and ends on May 3, with travel to southern Morocco for the start of the retreat on May 4. Guests should arrive on April May 30 in Marrakesh and stay overnight before we pick you up at a hotel of your own choosing on May 1. Pricing does NOT include the 1 night stay in Marrakesh on April 30. Guests should book their air ticket to arrive in Marrakesh but depart from Agadir airport. Our retreat base is located in the south of Morocco in a small village called Mirleft. It’s the kind of place described “as if time stopped”. It has quaint and off-the-beaten track appeal that has been attracting those looking for something a little different for years. We will stay in a beautiful and comfortable villa with a lovely pool where we will gather to practice yoga during the day. To inquire or book a spot, please email mamaliz@dryftwatersports.com. We will ask for a non-refundable $500 USD deposit to hold your spot. $2295 pp double occupancy, limited single occupancy available. Half the balance is due January 31, 2019 and the full balance is due April 1, 2019. Additional excursions 1-night in Marrakesh and 3-day desert camel camping trek are extra. Please inquire for optional excursion pricing when booking. Click here to reserve your week. · 7 nights, shared occupancy accommodation at our retreat villa. Guests will be sharing based on 2 or maximum 3 individuals per room. Single occupancy availability as well. · All meals other than restaurant meals we decide in advance as a group to go on for dinners We will do our best to accommodate dietary requests made in advance. 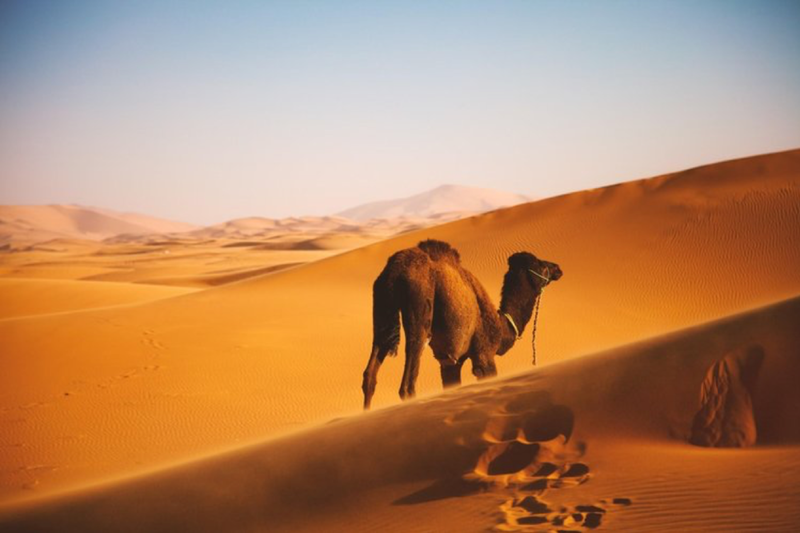 Riad/Hotel accommodations on April 30, 2019 for those taking part in the camel trek that begins on May 1, 2019. Transfers on April 30 is not included. Please read the cancellation policy, refund procedure and full terms and conditions below. You can arrive from London or Paris to Morocco. Agadir is the closest airport to our retreat base but those who are adding on additional trips to Marrakech or camel trekking may wish to fly in and out of Marrakech. “Each breath is a gift and each new day is a fresh opportunity to create the life that you want. Live with joy and express your love"
I walk a path of self-inquiry and yoga has been a beautiful tool in this ongoing exploration. Yoga started as the balancing medium for other physical pursuits in my life and has now become a deep source of nourishment and the grounded platform from which I move. Surfing lights my fire and has led me on adventures all over the globe. My love and connection to the ocean is probably my greatest influence and source of inspiration in my yoga practice. Sharing the ocean, its power, immensity and beauty is a true and humbling gift. Every day I am amazed at the parallels and lessons we learn from mother ocean and how they can be applied to bringing mindfulness, an open heart and a free flowing attitude into all moments in life. I am learning to let go more and more by the day...riding the waves. I advocate for women empowering women, through taking our health with a balanced and loving approach and using creativity as a tool in self-realization. Teaching, sharing my passion and encouraging you to find what it is that inspires you, is what keeps my stoke going! "Create your own paradise, wherever you are...."
Liv Hung is your principle host at Noorish Tofino. Her goal is to create the best possible retreat experience you can have, ensuring you are well fed, relaxed and open to whatever adventures you are ready to embark on. Noorish was born out of a passion to connect women to themselves and to each other through nature and wellness immersion. Liv is a passionate traveler who fell in love with surfing on a trip to New Zealand. She has been chasing peaks ever since. Through her travels, she has connected with many inspiring and strong women who have helped her take the path today as a retreat leader. She loves connecting with others, whipping up meals for her family and friends, and in general, enjoying living the "slow" life. Mama Liz is co-hosting the Surf & Wellness retreats with Liv Hung with the goal of deepening each of our connection to ourselves and the world around us. After a multiple year hiatus, during which Mama Liz faced some serious personal and health challenges in her life, including radical double mastectomy in 2013 she began surfing again while on a vacation in Nicaragua with her daughters. Her love of surfing was rekindled and now having combined her love of surfing, travel, and yoga Mama Liz laid down roots in Nicaragua and enjoys sharing her passion with others. Now a 200 hour YRT, Mama Liz has worn many hats during her lifetime including: a 20 year veteran of Wall Street; a ski instructor; a certified gyrotonics instructor; and a lifeguard. Mama Liz is overjoyed to have the opportunity to share her passion of surfing, yoga, and travel, with so many other dynamic, friendly and talented woman. We are all about the people. We work with only the best so our team can provide you with highest level of service possible. Our retreat groups are small - a maximum of 8-10 ladies per trip so you get the most attention and customized service. We are established travellers and adventurers who have discerning taste when it comes to where to stay, eat and go. We provide a welcoming environment for women of all backgrounds, cultures and experience levels. Whether you’ve never stepped on a yoga mat or surfed before to those who are wave warriors and shredders, we will welcome you with open arms. We believe in ENCOURAGE, EMBRACE, EMPOWER for each and every woman on our retreats. This is YOUR dream retreat, so let us make it happen for you. · All purchases are subject to re-confirmation within one business day after purchase, customers will be fully refunded if the orders cannot be confirmed. · Cancellations received 185 days (or more) of departure will incur a penalty of 10% per person. · Cancellations received within 154 days of departure will incur a penalty of 25% per person. · Cancellations received within 123 days of departure will incur a penalty of 50% per person. · Cancellations received within 92 days of departure will incur a penalty of 100% per person. · Trips require a minimum number of participants to avoid cancellation. We reserve the right to cancel a schedule trip and fully refund affected customers although DRYFT WATERSPORTS will make every effort to maintain the normal operation. · There is 6% handling fee add-on to the above penalties. Your refund request will be answered and processed promptly. If you do not receive the reply within one business day, please call the office immediately. We will not be responsible if email, mail or fax fail to reach us.